How do we put ideas into action and move communities forward? How can we put ideas into action and support the great work that Aspen Ideas Scholars and Presenters are doing around the globe? The Aspen Ideas Festival has a rich history of bringing together thinkers and visionary practitioners for open conversations on the toughest challenges facing our communities. Some 350 presenters, 200 sessions, and 3,000 attendees comprise the annual Festival, launched in 2005, on the Aspen Institute's campus in Aspen, Colorado. It is hosted by the Aspen Institute and The Atlantic magazine each summer in Aspen, Colorado. 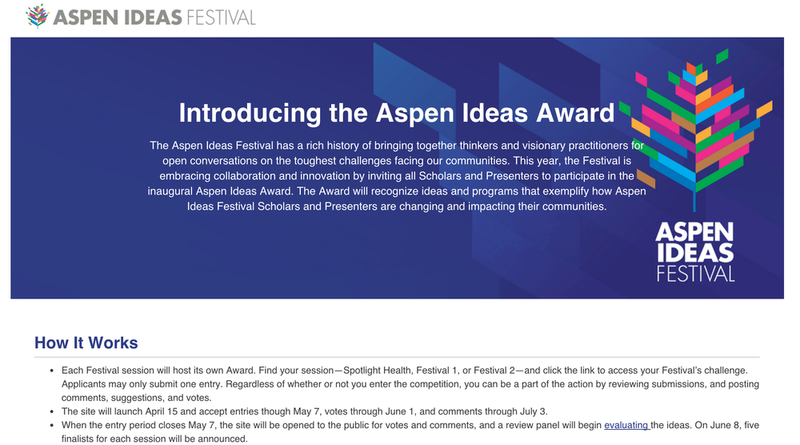 For 2015, the Festival embraced collaboration and innovation by inviting all Scholars and Presenters to participate in the inaugural Aspen Ideas Award. The Award recognizes ideas and programs that exemplify how Aspen Ideas Festival Scholars and Presenters are changing and impacting their communities. 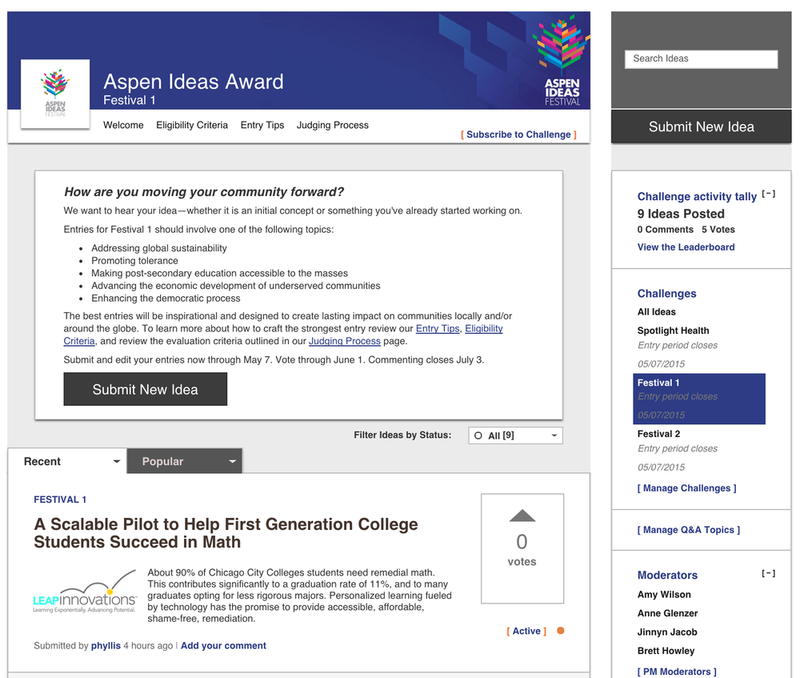 As the project manager for this inaugural Award, I led a team in a series of crowdsourced challenges through the platform IdeaScale and live pitch events during the Aspen Ideas Festival. Asking "How are you moving your community forward? ", the team garnered garnered 103 ideas 1,375 comments and 9,766 votes. In three months, we received more than 225,800 total page views from 26,473 unique users. We received participation from all 50 States and Washington, DC and 165 countries globally. 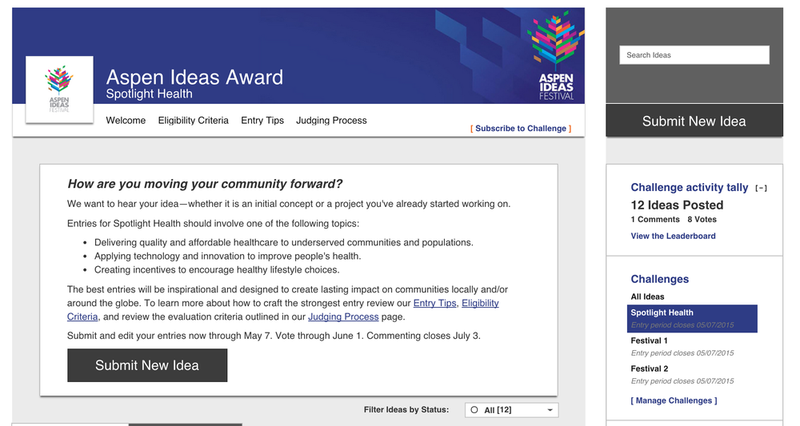 Aspen Scholars and Presenters who are making changes happen in their local communities submitted their ideas and 15 finalists (5 from each Aspen Ideas Festival (AIF) session) were selected based on crowdsourced votes and scoring from a panel of high-profile judges using pre-selected evaluation criteria. Those top finalists were invited to pitch their idea in front of a live audience and panel of judges, for a chance to win $25,000 to implement or support their idea and will be invited to 2016 AIF. Runners-up would each receive $5,000 towards their idea. At the Aspen Ideas Festival each of the 15 Finalists pitched like a true entrepreneur--in four minutes, with six minutes of questions from a panel of distinguished judges. Judges selected the top idea from each Festival section which received a top prize of up to $25,000 to put their idea into action. Winners will also be invited back to the 2016 Aspen Ideas Festival to share their progress with Festival attendees. Festival 2: Margaret Kolli, Human Needs Project. Transforms residents of the largest slum of Nairobi, Kibera into entrepreneurs through self-sustaining Town Centers. All three of the live pitch events were simulcast worldwide on the Aspen Ideas Festival website. A video of the final pitch event is to the right. To accomplish the polish of each of the pitches, each of the finalists three rounds of intensive pitch coaching sessions with our innovation team to make the stories compelling and the pitches tight. The Aspen Ideas Award is the first of it's kind in the history of the Aspen Ideas Festival to put ideas into ACTION. It created a mechanism to select and fund the best ideas from the Festival. There was an initial $75,000 purse, which was supplemented by a $60,000 private donation at the Festival (Total purse: $135,000). Our team demonstrated thought leadership around innovation and facilitated key relationships with high-profile attendees of the Festival and industry.